World Cafe Nashville: Delta Rae : World Cafe The members of the sextet talk about honing their artistic identity, getting comfortable in the country lane and letting their consciences guide them. All six members of Delta Rae are huddled around a table in a Nashville cafe, nursing paper cups of coffee and tea as the rain pelts the parking lot outside. Four of them, singers Brittany Hölljes and Elizabeth Hopkins and writer-instrumentalists Eric Hölljes and Ian Hölljes had played a brief opening set at the Ryman Auditorium the night before. Brittany recognized that a crowd comprised of radio industry types in town for Country Radio Seminar and lured by the hit-making rep of the night's headliner, Chris Janson, might not be familiar with her group, which was still new to the format. So she'd made a point to identify those sharing the stage with her as her brothers and their lifelong friend, and explained that their buddies in the rhythm section, bassist Grant Emerson and drummer Mike McKee had been given the night off, this being an acoustic performance and all. Initially marketed as a pop-rock, alt-pop or folk-rock outfit (depending on the project), the sextet has been around for the better part of a decade. They've taken the time to harness a romantic, southern mythos to open emotionalism, sugary, red-blooded harmonies, anthemic hooks and a propulsive, guitar-driven attack. In hindsight, it seemed almost inevitable that a family band with Delta Rae's sound and sensibilities would land on a country record label like The Valory Music Co., which released a pair of EPs by the group last year. The move was felt less like a crossover than a homecoming. 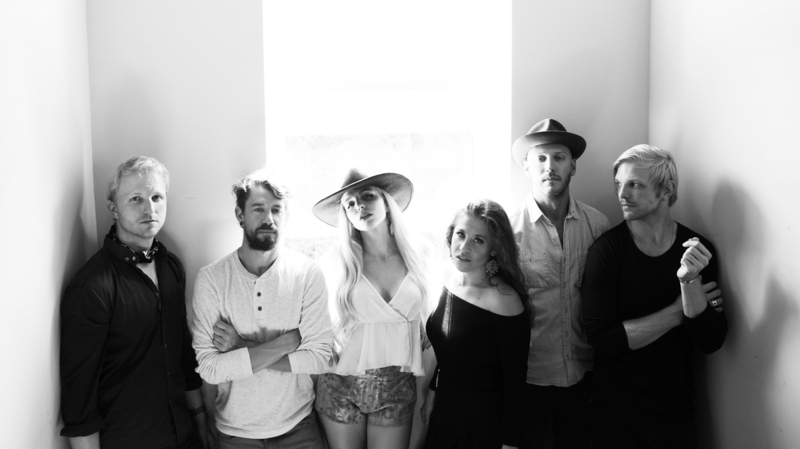 I caught up with the bandmates who spoke about honing their artistic identity, getting comfortable in the country lane and letting their consciences guide them. Jewly Hight: Do people respond to you highlighting the familial ties in the band differently in the country world than they did in the alt-rock scene? Brittany Hölljes: When we'd mention that we were in a family band and we were best friends, we would be making this really honest, heartfelt music, it made us kind of feel squeaky clean in the rock space. Nobody's shaving their head or dying their hair or has crazy piercings or is doing anything terribly scandalous. BH: But in the country world, I do think that we are on the more edgy side by comparison. I think that saying that might ground us a little bit instead of people being like, "Who is this band?" Once you ground it in siblings, they're like, "OK. The family aspect is there." Ian Hölljes: I'm a big believe in the world needs all types. There are a lot of great bands that do get created by outside people, but to us, it's really important to our identity that we were family and friends first and that we built this thing organically from the ground up for eight years now, and our friendship with Liz goes back 20 years. Eric and Ian could've tried to make a go of it as a duo. What was it about the idea of a four-voice, coed sound that made you recruit Brittany and Liz to move across country and join you in North Carolina? Eric Hölljes: I think we wanted to start the most exciting band that we could imagine, and that involved more voices than just our own and writing for people that we knew really well and whose voices we loved. It's always been one of my favorite sounds, a four-part wall of vocals. I saw a couple of you at the Women's March recently. BH: That was us. I think that's a huge part of this, is every member of this band identifies as a feminist. ... I feel so grateful to have people who understand so deeply that even if you are doing a lot of the creative work, giving the space for women to be the ones who are representing themselves and delivering the message is kind of the key to the whole thing. BH: It's been so empowering for us, creating such a safe space to grow as artists. I think having this incredibly supportive group behind us and knowing that they have our backs, it's really powerful. There was a time when you all lived in the same house. How long ago did that end? BH: We moved into the house in 2009, and by the time I moved out it was 2012. BH: Yeah, with mixed results. ...But the comingling of experiences and firsthand knowledge of what one another were going through was so poignant in that moment in life. I'll always look back on those days with such fondness, even though they were hard. Elizabeth Hopkins: And we would never wanna do it again. This week, you're participating in the rituals of the country music industry. What's it been like learning the language, rules and expectations of this world? EHopkins: Touch base with other artists. ... It's like we've found somewhere to sit at lunch. E Hölljes: The traditions in country music are also really deep and profound. We're still learning those. I think we all came from a bit more of the folk and Americana side of country music with a lot of what our parents listened to and what we were raised on, singer-songwriters of the '70s. BH: Growing up, for us three siblings, we were so limited in some ways in our exposure, because our parents had a great record collection and you could kinda do deep dives on it all the time. I still never get tired of the music I listened to growing up. ... It was James Taylor and Cat Stevens and Joni Mitchell. E Hölljes: Peter, Paul and Mary. BH: And Crosby, Stills, Nash & Young and the Eagles. Great artists who probably if they came out nowadays would be in the folk/Americana genre. ...When I hear a lot of Eagles songs, I'm like, "That's kind of a country song." Or some of Fleetwood Mac's more upbeat stuff. I'm so glad we're in the modern era where you can totally lose yourself in online videos of performances with Dolly and Emmylou and Johnny Cash and really immerse yourself in those cultural touchstones, even if you missed out on them growing up. Fleetwood Mac-influenced, coed vocal bands like Little Big Town and like Lady Antebellum tend to sing some of their songs to each other, like they're playing out a storyline between two people in their performances. But when I watch you perform, it's more like you're singing side by side in solidarity than singing to each other. How do you experience that? BH: Exactly like that, honestly. ... I think there's something so compelling about what Fleetwood Mac did when they would sing to each other. ... And yet I think there are moments like that that happen in a more familial way in this band. Like in our most recent single "No Peace in Quiet", the bridge of the song Eric and Liz usually turn to one another, and it's the most impassioned moment in that ballad. For Eric, this song really speaks to a breakup that he went through. And Liz has recently opened up about her dad's passing and how the song relates to that loss in her life. When I hear them sing that bridge to each other, it just feels like two people who are hurting acknowledging mutual pain. You hear it and you see it and it's powerful, but it's different than a jealous lover. You're not performing duets where you're playing out relational drama. BH: You're exactly right. It's two people walking together through experiences. IH: Obviously, we have boundless respect and admiration for Fleetwood Mac and they kind of did set the model for what we're aspiring to do. Not to bring it all back to the activist situation today, but I have to say that in this #MeToo Moment, I take a lot of inspiration from watching other models of relationships that are working between men and women in the world. I really love the relationships that we have with one another that are platonic, supportive and really hinge on all of us working toward common goals in these moments where, I think especially men, are really reflecting on our relationships with women and how we treat each other. I look at my relationships with my sister and with one of my best friends, and it's vitally important to me that it be a model of standing and singing side by side. There's a song that you've been performing for a few years now, "All Good People," written after the Charleston Church Massacre. Is that still in the repertoire? IH: It absolutely is. We play it where we feel it's appropriate. All of 2016 we played it at every show. BH: And all of last year actually, after Charlottesville. We brought it back into the set list. IH: Yeah. And it's something that I felt a real sense of guilt not having addressed in our music for a long time. That song was really difficult for me to conceive of, finding the right voice and trying to find the right way to be supportive. That was the challenge. I didn't want to wade indelicately into the conversation or to co-opt it inappropriately in any way. ...But to not say something I think is wrong? The silence of white moderates has been a problem for as long as civil rights have been an issue, which is forever in this country. BH: It's a song that we released in response to the Charleston Massacre, but that Ian had been writing for a long time before that as a response to the violence against black Americans that for so long went completely unreported on, and then once people had cameras in their hands, couldn't be silenced anymore. ... We love this country, and I think that's why we speak to it. It's why we march at the women's march. If you love something, you don't let it fall into these places of darkness. You wanna lift it up all the time. E Hölljes: We just played a show in Colorado called Back the Blue that was in response to a police officer being killed in the line of duty with two kids and a wife that he left behind. We were doing it to raise money. I don't think that these things are mutually exclusive at all. That's the problem, I think, with the conversation. I don't know how to fix any of that at all, except to just keep talking about the things that we think matter. IH: But as southerners and as country artists, I think there's a unique responsibility to talk about it and to say where you are on those issues. You're in a unique position. There are a lot of outside eyes on the country world, which has long been known for placing an emphasis on morality. EHopkins: I think that the biggest part of what's so exciting about being a progressive band in country music—since country music is all about upholding family values—is that we have a chance with our music to also bring racial and gender equality into the light. Equality should be a family value. Let's do that with our music. BH: Honestly, some of the most conservative people I know love songs with such messages of equality, universal acceptance and love. I think that there's a degree to which music can create a space and speak to people's souls in a deeper way than even they wanna recognize on the surface. The idea that nowadays the folks who come to our show are from all across the spectrum of who represents America means so much to me. It's what I've always dreamed of for this band. You've always identified as a southern band. How have you leaned into that since you moved into a country lane? IH: My favorite writing is southern literature. ... I love Pat Conroy, Reynolds Price, Toni Morrison, James Agee. Actually, right before we started the band, I was working as an assistant to the southern author Reynolds Price. He co-wrote some of James Taylor's songs. I always thought that one of James Taylor's great strengths as a songwriter was his southern imagery. ... I have always aspired to have it be a part of our songwriting, going back to our very first album and going back to the very first song on that album. E Hölljes: But the imagery got a little sharper on this most recent EP we released last year. We wrote 70 songs for that record, but the ones that really stood out for us as the statement that we wanted to make focused on exactly what you're describing. Wood shedding like that is a new process for you. What difference do you feel it's made? IH: I think you can hear it in this interview; we're a six-headed monster as a band. So when you have this combination of voices and feelings and influences, it takes a while to find your voice. ... You not only have to find your voice as a writer, in terms of writing things that are true and honest. You also have to find the voice that cuts through to the audience. I think that's what the wood shedding is doing for us. BH: We started making music that we loved, and we thought that that was all we had to do: you just form a band and start making music that you love. And on some level that's true, but unless you want other people to define you, you have to define yourself.